Nisha Nayar, Stella Gonet, Paul Higgins, Sharon Duncan-Brewster & Rudi Dharmalingam. Photo by Manuel Harlan. George Osborne giveth with one hand (reforming stamp duty) but smasheth in the face with the other (cuts, cuts, cuts). Meanwhile, the fear is spreading with Jules Pipe, the chairman of London Councils, yesterday warning of a £3.4 billion black hole in funding for frontline services. Step up acclaimed writer Jack Thorne with topical new play Hope, which examines exactly what ‘austerity’ means for one beleaguered Labour council. Run by the charming yet weak-kneed Mark (played by the always excellent Paul Higgins), the council has pulled out its ledgers to see what services it can ‘streamline’ without causing too much of a furore. Some of the tinkering seems smart at first — an hour less street lighting each day, until a violent attack happens in an unlit alley. Then the council really stumbles when the axe falls on a daycare centre for the disabled and the consequent Twitter petition ignites a media firestorm. It’s the straw that breaks the council’s back, and slowly the limp-wristed officials decide to muscle-up and say ‘no more’ to the Tories at the top. This sounds like a strident, motoring plot-line, though actually Thorne’s play is weary rather than angry. He is especially tired of the milksop Labour leadership and dismayed by the failure of people to stand up against the wholesale destruction of social services. Hope takes its time, building the characters carefully so we feel both the political pressure and the cluttered human dramas that bog down their attempts to rally together. The ensemble cast is strong and the dialogue nicely polished, though some narrative strands reap more rewards than others. Mark’s floundering is watchable but tiring after a while and by the end you feel that the bolder characters in the council should have had more airtime. It's young actor Tommy Knight though, as Mark’s precocious son Jake, who steals the show. The sparky and unpredictable conversation between Jake and George, a disillusioned socialist played by veteran actor Tom Georgeson, suggests the two should have a spin-off play to themselves. Hope is an ambling piece with only flashes of the frustrated fury that the subject and story promise. No one wants a polemic, but there is real dramatic heat in the premise, which isn’t quite fully marshalled. Funny, topical and very well-played, Hope is a little of what we need, but not quite urgent enough. 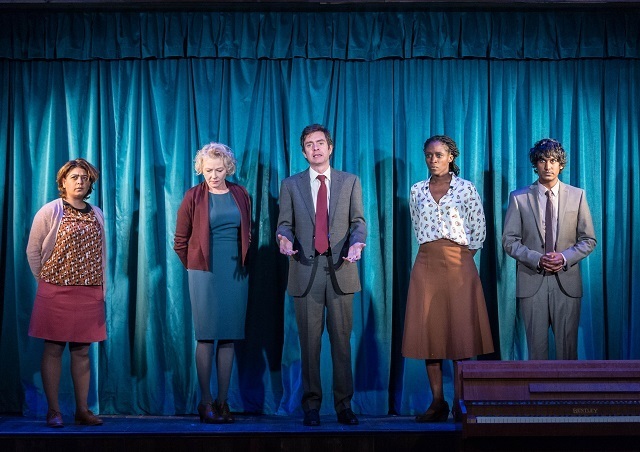 Hope is on at the Royal Court until 10 January 2015. Tickets cost between £10 and £32. Londonist saw this play on a complimentary ticket.